Spinal Tap Hits The Road Unwigged And Unplugged 25 years after their musical mockumentary This Is Spinal Tap, Christopher Guest, Harry Shearer and Michael McKean are back... not as Nigel, Derek and David, but as themselves. 25 years after their musical mockumentary This Is Spinal Tap, Christopher Guest, Harry Shearer and Michael McKean are back... not as Nigel, Derek and David, but as themselves. They'll be playing songs from Spinal Tap and A Mighty Wind on their 30-city tour. Hear an acoustic medley of songs from This Is Spinal Tap and A Mighty Wind. Twenty-five years ago this week, a little film came out about three guys — David, Derek and Nigel — and their intense desire to rock. That film, of course, was This Is Spinal Tap. Much has changed since 1984, when the movie was first released, but, as they say in the music business, the song remains the same. This week in Southern California, Spinal Tap reunited and held a press conference announcing a new 30-city tour. 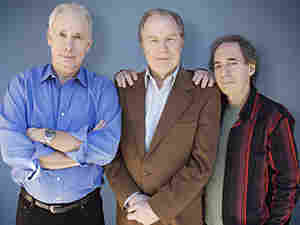 Actors and real-life musicians Michael McKean, Christopher Guest and Harry Shearer took to the stage at the House of Blues, where they played a few songs from the movie, including "Hell Hole." Afterward, the band was interviewed by Kurt Loder, of MTV Music News fame. In classic Spinal Tap fashion, the microphones weren't working, and the guys were cracking jokes on the fly. It was as if we somehow had been transported into a 2009 version of the mockumentary.. If that doesn't make any sense, you're likely one of the few Americans who haven't seen the film, so here's the basic premise: It's a faux documentary that chronicles an aging British heavy metal band, Spinal Tap, as it tries to stage a North American tour. In the movie, just about everything that can go wrong with a band goes wrong. Drummers spontaneously combust. Band members get lost backstage before a concert. An elaborate set designed to look like Stonehenge gets built at a height of 18 inches, instead of 18 feet. To make it seem bigger, the band's manager hires little people to play druids who dance around it. When Spinal Tap goes on tour this time around, there will be no Stonehenge. That was one of many questions the actors were asked. Someone else wondered if little people would appear as druids. Jokes aside, everyone at the House of Blues really wanted to know why the band was getting back together after all these years. In part, the answer has to do with how Spinal Tap will perform. This tour is called the Unwigged Tour: The band members will perform without the ridiculous rocker coifs seen in the film. They'll trade in the spandex for sport coats. And, as Harry Shearer explained, they'll play acoustic bass and guitar. In addition to playing songs from Spinal Tap, they'll also perform music from the film they made about the folk scene, A Mighty Wind. There's also a new album in the works, Michael McKean says, which will include some Spinal Tap songs that have never been recorded before. "There's a new track which has really existed as kind of a peripheral joke, you know," he says. "When we played live as Spinal Tap, there's a song called 'Short and Sweet,' which is 20 minutes long. That's when we have guest players come on, and they play for as long as they want and we go out and get coffee." The Spinal Tap guys readily admit that the new CD, the new tour and the bobbleheads they're working on selling are all ways to help pay the rent. But, McKean says, there's more to it than money. He says they get a kick out of how, even in 2009, Spinal Tap still has cultural resonance. The Unwigged Tour kicks off April 17 in Vancouver, British Columbia.